That sound you hear is the tick-tock of a super-accurate quantum clock, counting down the time until quantum information science enables a leap forward in cybersecurity, navigation, code breaking and all kinds of other puzzles. There are strange phenomena that cannot be explained by the laws of classical physics, unusual enough that they disturbed Einstein. This discovery stemmed from observations in the early 20th century on the nature of light and heat, and gave birth to the field of quantum mechanics, required to describe the behavior of atoms, photons and subatomic particles, as well as the universe as a whole. “Quantum” refers to the fundamental discreteness of nature—that at the smallest scales, measurements of energy, of light, of matter, and so on, come in indivisible packets. Quantum mechanics revolutionized physics and continues to revolutionize science and technology today. Early research led to numerous technologies including lasers, magnetic resonance imaging (MRI), transistors and microprocessors. These advances leveraged certain properties of quantum mechanics but did not take advantage of all the odd phenomena that quantum mechanics embodies—such as that light is both wave and particle (matter-wave duality), and that a given electron, for example, can be two things at once until observation freezes it in one state (superposition). In the 1970s, physicists merged quantum properties with information science, and by the 1990s it was clear that the marriage of these fields into quantum information science may have sweeping impacts, not only on defense applications, but also on the day-to-day lives of nearly everyone on the planet. The tipping point for an appreciation of the importance of quantum information science came courtesy of mathematician Peter Shor. He developed an algorithm that leveraged quantum properties to factor very large numbers efficiently. While this may seem only like a mathematical curiosity, the importance of this algorithm cannot be overstated because the difficulty of the factoring problem is at the root of the encryption—known as the RSA cryptosystem—that encodes nearly every electronic transaction underlying secure government communications, emails, bank transfers, and so on. While traditional computers cannot crack RSA encryption on any timescale relevant to security considerations, quantum computers would render it useless. As a result of Shor’s insight, the Army and intelligence community immediately started investing in quantum computing research. The United States has held a leading position in the development of quantum information science and associated technologies for many years. The Army, recognizing the importance of the field to the future fight, has even boosted its baseline investments since 2015 to explore capabilities in ultra-secure communications and networks and dramatically to improve precision sensing and timekeeping. The United States, however, isn’t alone. Canada, Australia, the Netherlands, the United Kingdom, the European Union, Singapore, Russia, North Korea and Japan have all invested heavily in research into quantum information science. China established a $10 billion national laboratory primarily targeting pre-eminence in quantum communications and successfully launched a quantum satellite in 2016. After the satellite program’s success, China began building a nationwide quantum network for impenetrable military communications and financial transactions. The House Science Committee recently announced plans for a 10-year National Quantum Initiative to increase America’s strategic focus on quantum information science. This effort will provide a greater degree of coordination between agencies, essential for successful capability development. Such a large initiative will depend on multiple investments and partnerships in academia, DOD labs and industry. It’s important to understand the basic principles of quantum mechanics essential for information applications, as well as how quantum information science can enhance or establish certain technologies for the Army, including quantum cryptography and communication, quantum metrology (measurement) and sensing, and quantum computation and simulation. Three of the most important concepts to understand in quantum mechanics are superposition, matter-wave duality and entanglement. Superposition is the counterintuitive ability of a quantum entity, such as an electron, to be in two states, “0” and “1”, simultaneously, such as the lowest energy level of an atom and its first excited state. However, the atomic state is only defined when it is measured: Until we “look” at the atom, it is in both states at once, with probabilities that can be manipulated with quantum operations. Such “quantum bits,” or qubits, are therefore unlike classical bits, which are in one state, either 0 or 1, whether we measure them or not. Quantum superposition is also at the heart of how the world’s most exquisite atomic clocks and magnetometers function. Entanglement – Two or more qubits can further demonstrate differences from classical bits: They can be entangled such that a measurement on one instantaneously determines the outcome of the other. Such nonclassical correlations persist even over long distances, seeming to enable information transfer faster than light. This disturbed Einstein, who dismissed it as “spooky action at a distance.” Ultimately, many experiments have shown that the information transfer is still limited to the speed of light as described below. However, the nonclassical correlations do indeed permit a type of communication security and computation unavailable to classical communications and computing systems. Quantum entanglement is expected to provide quantum networks with the ability to transmit quantum information with unparalleled security. An additional security advantage stems from the fact that qubit systems cannot be copied without fundamentally disturbing them. This means any attempted copying will absolutely be revealed, which makes this type of communication system very enticing to the Army. Current uses of quantum cryptography and secure quantum channels primarily focus on the creation and distribution of quantum keys. Classical channels are still used to transfer information between two parties, but this information has been encrypted by quantum keys and is unreadable by the receiver without receiving the key over a quantum channel. Ultimately, more complex quantum networks are envisioned that should provide the Army with a robust network secured not only by the protocols but also the inherent rules of quantum mechanics. 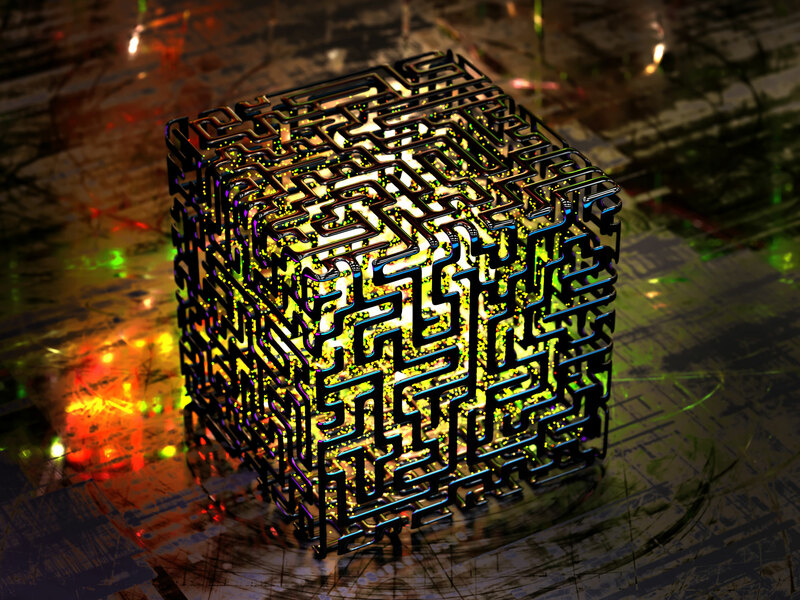 To fully realize this, the Army is investigating distributed quantum systems that can store, process and transmit information using networks of entangled quantum memories. These are active areas of research within both Army laboratories and supported extramural efforts. Quantum systems possess advantages over classical systems for some metrology—measurement—and sensing applications. One reason for this is that the transition frequencies of quantum atomic systems are exact, reproducible and identical within a particular element (e.g., rubidium or cesium). The well-defined transition frequency makes them excellent standards for clocks, with far better performance than quartz crystal oscillators such as those used in wristwatches. A second reason is that qubits can be exquisitely sensitive to environmental fields, such as magnetic or electric fields. While this sensitivity is one of the reasons building a quantum computer is difficult, it is also the reason qubits can be excellent sensors. Quantum communication networks require the precise synchronization and stabilization that atomic clocks provide. When combined with quantum sensors for acceleration, rotation and gravity, these clocks will also ensure robust navigation in GPS-denied environments. 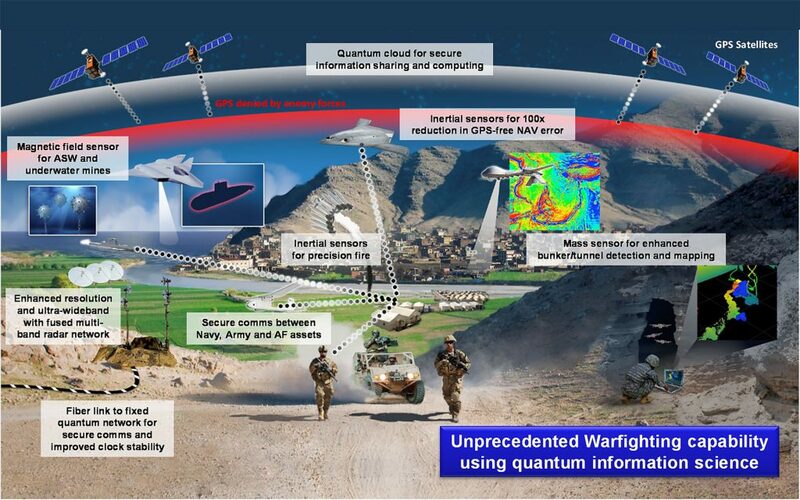 Together, quantum-enabled enhancements such as these contribute to the assured position, navigation and timing capabilities crucial to the Army’s future success. The application of quantum information science to general problems in sensing and metrology has shown that measurements can surpass classical detection limits. This enhanced sensitivity is of interest to the Army for a variety of applications, ranging from ultra-precise magnetometry to distinguish tank and submarine decoys from the real things, to precise chemical detection with limited sample volumes. As a result of these varied applications, the Army has research programs related to quantum metrology and sensing, and is now targeting assured position, navigation and timing as a crucial area for increased investment. Quantum computers function via controlled initialization and manipulation of qubits to execute quantum algorithms like Shor’s. During these operations, qubits are placed in superpositions and entangled with one another. Recalling that quantum phenomena are tied to probabilities of being in certain states, we can understand that during a quantum computation, all of the possible results exist with some probability. Quantum algorithms function such that the probability of getting the correct answer upon measurement is enhanced while the probabilities of all of the incorrect answers are suppressed. It is these enhancements and suppressions together with state sampling (is the electronic state 1 or 0?) that can enable exponential processing improvements that make quantum computing so fundamentally different from classical computing. Several physical platforms are viable candidates for building quantum computers. Although qubits based on trapped atomic ions, superconducting and semiconducting systems seem to hold the most promise for large-scale implementations, they are not the only ones, and the question is still open as to what type or types of qubits will enable the first quantum computer capable of solving classically intractable problems. While quantum computers large enough to run Shor’s algorithm for code breaking are decades away, when we have these computers they will be able to attack multiple problems of interest to the Army in addition to code breaking, like resource optimization, optimal war-gaming, efficient command, control, communications and intelligence, and maximal logistical support. Quantum simulators can be thought of as special-purpose quantum computers suited to understanding specific problems, such as the design of novel materials. Quantum simulators are expected to solve some long-standing problems in physics and chemistry, including the origin of certain types of superconductivity, and for chemical (e.g., pharmaceutical drug or energetic material) design. This specialization removes many of the constraints that make general-purpose quantum computers decades away from realization, and, as a result, near-term quantum simulators may have a more immediate impact on Army capabilities, especially in materials design. Quantum information science provides unprecedented advantages that are impossible under classical laws of physics. Some of these advantages that rely on superposition or matter-wave duality are already in the early stages of application in quantum clocks and sensors, while some involving multiparticle entanglement are further off, including quantum networks. Some will require decades of additional development, such as complex quantum computers. Quantum mechanics has proven over and over that with each included quantum ingredient, revolutionary capabilities occur, and we should be confident that this will continue to occur. Untapped aspects of quantum information systems have the potential to yield far-reaching innovations and unprecedented technologies, with unparalleled precision, sensitivity, speed, information capacity and other decisive factors, and will help the U.S. Army pave the road to dominance for many years to come. For more information, email Dr. Kimberly Sablon at kimberly.a.sablon.civ@mail.mil. KIMBERLY SABLON is the director, basic research, in the office of the Deputy Assistant Secretary of the Army for Research and Technology in Arlington, Virginia. She holds a Ph.D. in applied physics (microelectronics and photonics) from the University of Arkansas, and a B.S. in chemistry and physics from the University of the Virgin Islands. PETER J. REYNOLDS is a senior research scientist at the U.S. Army Research Laboratory’s Army Research Office, Research Triangle Park, North Carolina. He holds a Ph.D. in physics from MIT and an A.B. in physics from the University of California, Berkeley. He received the U.S. Presidential Rank Award for Distinguished Senior Scientist in 2015, has been a Fellow of the Army Research Laboratory since 2007, and was elected a Fellow of the American Physical Society in 1995. FREDRIK FATEMI is the chief of the Quantum Technology Branch at the Army Research Laboratory in Adelphi, Maryland. He holds a Ph.D. in molecular physics from the University of Virginia. SARA GAMBLE is a program manager at the U.S. Army Research Laboratory’s Army Research Office at Research Triangle Park. She holds a Ph.D. and an M.S. in applied physics from Stanford University and a B.S. in physics from the University of Florida. Just add water! Research with a difference Experiments in hyperspeed Why The Hype?